This dual-action balm helps you prime and touch up throughout the day. Prime in the morning by applying a thin layer to clean, lightly moisturized skin. Apply your makeup as usual. I have used this for a long, long time and still love it! Fills in pores and I also use it around my lips to soften those lines and under my eyes to soften the look of concealer. I absolutely LOVE this primer. Goes on smooth. Great coverage. No greasy feeling and skin is noticeably smoother. Works well over makeup too for touch ups. Love this primer. I have oily skin and large pores. This product does a magnificent job of blurring pores and reducing shine. So glad I tried it. 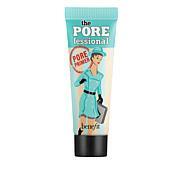 Tried this primer and now it is a main stable in my makeup back. I use this product whether fresh faced or under makeup. It makes the skin look amazing! I dont waste my time nor money with other primers now. You have a customer for life. Does a wonderful job, looks so natural, and my skin feels so silky. POUR-fic product!